Video, Audio Format မ်ဳိးစံုကို Play ႏိုင္တဲ့ 8K Player ျဖစ္ပါတယ္.. Video Resolution မွာ အျမင့္ဆံုးျဖစ္တဲ့ 8K ကိုေတာင္ Play ႏိုင္တာဆိုေတာ့က်န္တဲ့ Format ေတြ ေျပာစရာေတာင္မလိုေတာ့ဘူး.. မိမိကြန္ပ်ဴတာနဲ႔ကိုက္ညီတဲ့ Resolution ထဲက အျမင့္ဆံုး Resolution အတိုင္း ရုပ္ထြက္ေကာင္းေစမွာပါ.. ဒါ့အျပင္ Gif အျဖစ္လည္း ထုတ္ေပးႏိုင္သလို Loop လည္း လုပ္ႏိုင္ပါမယ္.. ကိုယ္ႀကိဳက္တဲ့အပိုင္းေလးကို bookmark လုပ္ထားႏိုင္ၿပီး ကိုယ္ႀကိဳက္တဲ့အခ်ိန္ အဲဒီေနရာကေန ျပန္ၾကည့္လို႔လည္း ရပါမယ္..
လိုင္စင္အတြက္ ၁ ႏွစ္စာ လုိင္စင္ကီးကိုလည္း အလကားေပးေနပါတယ္..
https://www.mediadimo.com/free-video-player လင့္ကိုသြားၿပီး အီးေမးျဖည့္. Get License Code ကိုႏွိပ္တာနဲ႔ တရားဝင္လိုင္စင္တစ္ခု ရရွိမွာပါ..
Video, Audio Format မျိုးစုံကို Play နိုင်တဲ့ 8K Player ဖြစ်ပါတယ်.. Video Resolution မှာ အမြင့်ဆုံးဖြစ်တဲ့ 8K ကိုတောင် Play နိုင်တာဆိုတော့ကျန်တဲ့ Format တွေ ပြောစရာတောင်မလိုတော့ဘူး.. မိမိကွန်ပျူတာနဲ့ကိုက်ညီတဲ့ Resolution ထဲက အမြင့်ဆုံး Resolution အတိုင်း ရုပ်ထွက်ကောင်းစေမှာပါ.. ဒါ့အပြင် Gif အဖြစ်လည်း ထုတ်ပေးနိုင်သလို Loop လည်း လုပ်နိုင်ပါမယ်.. ကိုယ်ကြိုက်တဲ့အပိုင်းလေးကို bookmark လုပ်ထားနိုင်ပြီး ကိုယ်ကြိုက်တဲ့အချိန် အဲဒီနေရာကနေ ပြန်ကြည့်လို့လည်း ရပါမယ်..
လိုင်စင်အတွက် ၁ နှစ်စာ လိုင်စင်ကီးကိုလည်း အလကားပေးနေပါတယ်..
https://www.mediadimo.com/free-video-player လင့်ကိုသွားပြီး အီးမေးဖြည့်. Get License Code ကိုနှိပ်တာနဲ့ တရားဝင်လိုင်စင်တစ်ခု ရရှိမှာပါ..
Get vivid visual/audio effect to play H.265/HEVC encoing 4K or HD/SD videos losslessly on PC. 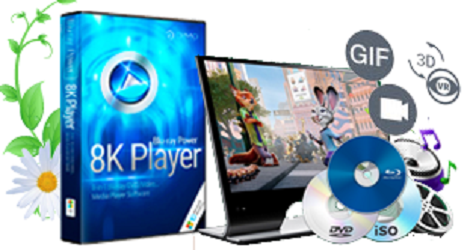 Enjoy HD entertainment on Blu-ray/DVD disc/folder/ISO whether it’s DTS-HD Master Audio or Dolby TrueHD. Wonderful video watching experience for watching any HD/SD video files with immersive effect. Smooth video playback without any stutter or lag, better than other common media players. Use loop option to repeat video and hands-freely to immerse into the stunning visual world. Take snapshot of the shining moment of the video. No any extra software is needed. Record what’s happening on the screen as a straightforward video. It saves time and is quite effective.